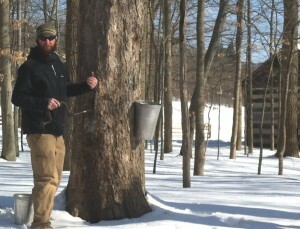 Join us at Hale Farm & Village March 9, 10, 16 & 17 – 2019 for the Maple Sugar Festival and Pancake Breakfast. *Presale tickets are no longer available – Tickets ARE available at the door on event days! Enjoy a hearty pancake breakfast and then head out into the Sugaring Camp to learn about tree tapping, the maple sugar process and view oxen demonstrations. Experience period arts and crafts such as glassblowing, blacksmithing, pottery and spinning and weaving. Breakfast served: 10 am – 3 pm (Hale Farm closes at 4 pm) Includes, pancakes, sausage, fruit, coffee & juice. Thanks to the generous support of Bissell’s Maple Farm we will offering real maple syrup with breakfast! Special thanks to Acme Fresh Market for their support of this years Maple Sugar Festival. For an extraordinary experience, arrive by train on Cuyahoga Valley Scenic Railroad’s Maple Sugar Express! Visit www.cvsr.com for tickets.